Let’s not beat about the bush, Hong Kong isn’t exactly on the cheap side. But don’t fret, with some forward planning and an open mind, you can still have a fantastic time without worrying about your wallet. With plenty of sights to see and cultural hotspots to explore, it’s possible for the budget-conscious to tailor their time to the way they like to travel. From museums and markets to temples and ghost towns, this bustling metropolis has a plethora of things to do that won’t trouble the bank balance. Here, we’ll list the best things you can do for free while in Hong Kong. For cultural folk, galleries and museums are in abundance across the city. Every Wednesday, seven of its museums are open for free, including the Science Museum, Space Museum and the Museum of History. The latter offers an in-depth exploration of China’s sprawling three-millennia long history, from the country’s inception right up to the present day. There’s even a recreation of what a typical Hong Kong Street would have looked like a century ago. Hollywood Road, meanwhile, has no shortage of art galleries to wander around at your leisure, and since the city’s art scene has grown immeasurably over the past few years, there’s never been a better time to check it out. We recommend places such as Connoisseur Contemporary, The Cat Street Gallery, Sin Sin Fine Art and Puerta Roja. If you don’t mind walking a little further, Above Second is a superb gallery that specialises in urban art, illustration and comics books. As an added incentive, many of the galleries offer a complimentary glass of Champagne too. We can’t argue with that. While you won’t be spending anything, Hong Kong’s myriad of markets offer a glimpse into the true atmosphere of the city; lively, vibrant and bustling with sights, sounds and activity. Colourful in both senses of the word, be sure to bring along a camera and get snap-happy; the wares on display, garish clothing and endless haggling all make great photo opportunities. Stanley Market is perhaps the country’s most well-known market and well worth a visit. Situated by the sea, the ambience is cheery and energetic, with an undeniable spectacle to the place. The nearby beach makes a great little stop off after you’re done strolling through the stalls, too. Steeped in religious heritage, Hong Kong is dotted with an abundance of temples and nunneries. With numbers in the hundreds, there’s a lot to choose from, but almost all are free to enter, providing visitors with spectacular architecture and an area of serene contemplation. Take a trip to the Hau Wong Temple in Kowloon City, one of the oldest of its kind in Hong Kong, or visit Po Lin, perhaps the city’s most popular monastery. Home to the 100-foot-plus “Big Buddha”, this bronze-built, cross-legged icon is an attraction in itself. The adjoining views of the countryside are superb, and the monastery’s monks serve up superb veggie fare in its canteen. A newer temple, but one that’s no less impressive, is the Chi Lin Nunnery. First built in 1934, it was made over in 1998 with not a single nail; a series of interlocked wooden beams and high ceilings pay tribute to the style and craft of the Tang Dynasty. With the Nan Lian Garden nearby too, this area of tranquil, quiet reflection refreshes the spirit every minute you spend here. Speaking of tranquillity, the verdant hills above Hong Kong Park house the Edward Youde Aviary, a beguiling bird sanctuary named after a former Hong Kong governor that just so happens to be the largest in Southeast Asia. Home to 600 birds across 80 species, this serene oasis is replete with vivid greenery, cascading waterfalls and small ponds, along with wooden bridges suspended from its trees. It’s from here you can spot the feathered inhabitants of the aviary, making for an enchanting experience away from the hustle and bustle of the city. Scaling some of the city’s skyscrapers affords you some incredible views, without having to fork out for the opportunity either. 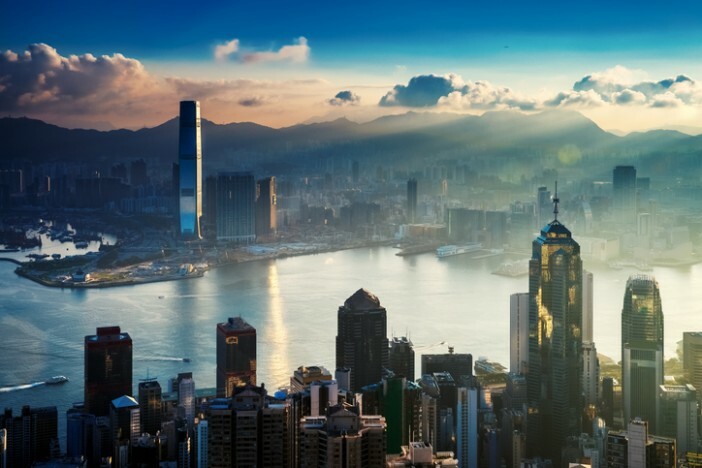 The 43rd floor of the Bank of China Tower features a viewing platform which allows you to take in a spectacular vista, complete with the city’s shimmering harbour in full view. If you’re up for it, then take a hike on Dragon’s Back, a rolling two-hour jaunt that gives you plenty of breath-taking views along the way. It’s a bit tough at first, but when you’ve reached the top and seen pure nature in all its glory, you’ll be glad you did it. But if breaking a sweat isn’t your thing, then Ha Pak Nai is a more than adequate substitute. A shallow beach in the far northwest New Territories area, it becomes bathed in purple and orange hues at sunset, creating a romantic, picture perfect view that couples flock to month upon month. For another escape from the city, Hong Kong’s beaches are endlessly beautiful havens that don’t cost a thing. Head to Tai Long Wan, a stretch of land that adorns the eastern side of the Sai Kung Peninsula. It’s further out than you might think necessary, but once you’re there, its fresh air and serene shores are well worth making the effort for. We hope you’ve enjoyed reading this article. To see the latest deals on Hong Kong cruises, head over to our dedicated page right here, or alternatively, give our friendly customer care team a call on 1300 948 844. Discover Hong Kong’s best kept secrets in our extensive city guide.